Both the quality of food and service at Rasoi II are declining. During our earlier visit to Rasoi, we found the lunch buffet so good that we heartily recommended it to our friends. 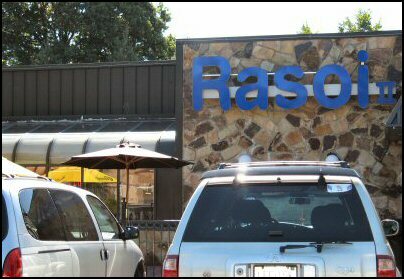 Unlike our first visit to Rasoi, our recent visit was disappointing. We found flies hovering round our table, below average and bland food, and poor service. Located near Patel Cash and Carry on the main Oak Tree Road, Rasoi offers a variety of North Indian and Indian-Chinese dishes. The menu adequately covers both vegetarian and non-vegetarian items. We tried lunch buffet on a week day and found the food to be below average and service shoddy. At $8.95 per person, the lunch buffet at Rasoi was not as tasty as the one served in nearby Moghul or Malgudi or even in the other Rasoi location on Newark Avenue in Jersey City, NJ. The buffet had about 10 main course items, salad bar, three types of appetizers, two types of desserts and water melon fruit pieces. Appetizers included Hariyali Kabab, Papdi Chaat and Chilly, Cauliflower and Potato Pakoras/fritters. Besides Bread, the main buffet table included Plain Rice, Vegetable Lomein, Stir Fry Vegetables, Mixed Vegetable Jalfrezi, Alu Mutter, Panner Makhani, Amritsari Choley, Chicken Mushroom sauce and Chicken Tikka Masala. While vegetable lomein was tasty it was luke warm. Paneer Makhani was easily the best item from the main course. Mixed vegetable jalfrezi was bland and the other vegetable items tasted so so. Chicken Mushroom sauce and Chicken Tikka Masala were nothing to write Oak Tree Road Home about. Overall, our main complaint about the Rasoi Lunch buffet is that it's too bland and there were no standout dishes. It lacked the spicy flavor that makes Indian food so tasty. As we needed something invigorating to drink, we ordered Pinacolada ($3.95) and Mango Lassi ($3.50). While Pinacolada was okay, the Mango lassi tasted like a distant cousin of the real Mango Lassi. Sadly, Rasoi does not offer either Indian Coffee or Masala Chai. (Pinacolada and Mango Lassi are not part of the lunch buffet). Desserts included Gulab Jamun and Kheer. Normally disappointing at most Indian restaurants, we found Kheer quite tasty at Rasoi. To get a better feel for the food at Rasoi, we also ordered a Takeout of Chilli Chicken Dry ($8.95) and Vegetable Manchurian Gravy ($8.95). Unlike at Saravanaa Bhavan, our Takeout order at Rasoi came neatly with plates, napkins, spoons and sauces. Chilli Chicken was a disappointment - neither spicy nor tasty - but the Vegetable Manchurian with Gravy was extremely satisfying, reminding us of the various occasions we had that item on Brigade Road (Bangalore) in a distant past. Service has fallen considerably at Rasoi since our last visit. Although there are quite a few waiters, it's difficult to catch their eye. One of our waiters removed the finished plates from our table so clumsily that he dislodged the pineapple piece from our Pinacoloda glass on to the table. But what upset us was that he neither apologized nor offered to replace it. He just muttered "Oh" and scooted. The crowds notwithstanding the food and service at Rasoi have deteriorated so much that we no longer recommend it to our friends.